I get totally excited about examples of parasites inducing crazy behavioral changes in their hosts. While my favorite example is Toxoplasma gondii‘s behavioral effects on humans (see a previous post on this protozoan here), parasitic fungi that behaviorally manipulate ants also geek me out. 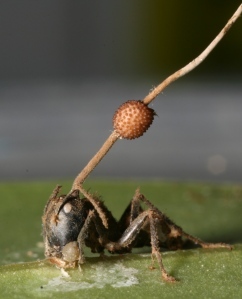 This particular fungus, Orphiocordyceps unilateralis, infects the brains of ants. When the fungus is ready to breed, it gets its ant chauffeur to leave the colony and take it to a place where abiotic conditions (temperature, moisture, etc) are favorable and where it will be easy for the fungus to spread its reproductive spores over a large distance. When the ant finds an appropriate leaf, its mouthparts (known as mandibles) clamp down around a vein on the leaf. The ant never releases this “death grip” and will stay here until it dies. The fungus produces an antennae-like stalk which protrudes from the ant’s head and provides a launching point for the fungus’ offspring. 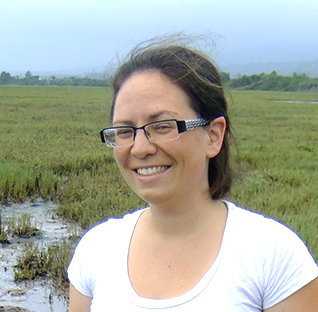 A paper from the Hughes Lab describing behavioral changes in infected ants can be found here. The fungus is so effective at infecting new ants and manipulating their behavior that large numbers of dead ants can be found clutching leaves in ant “graveyards“. One of the difficulties with the study of behavioral manipulation is that it’s hard to study it historically. The fossil record provides good data on which species co-occured in a particular area, but it’s hard to tease out much information on how these individuals interacted behaviorally. You have to be clever if you’re going to coax fossils into giving up any behavioral secrets, but every once and awhile the right fossil and the right researcher meet. David Hughes and his colleagues noted that ant death grips leave very distinct scars in particular locations (around the leaf veins). Only infected ants produce these death grips, so evidence of it is highly suggestive of fungal behavioral manipulation. They found these scars in 48 million year old fossilized leaves, suggesting that fungus have been controlling their ant hosts since at least the Eocene. That’s right, when modern mammals where just beginning to appear on the scene, fungus had already figured out (in an evolutionary sense, of course) how to hitch a free ride via ant brain control. Thanks to Dave Harris for sending me the article on behavioral manipulation in the fossil record! The paper can be found here. Very cool. Also, definitely one of the worst ways to die. I first learned about this fungus at the Museum of Jurassic Technology (it’s not exactly what it sounds like it is) and it surprised and piqued my curiosity all the same! I don’t know if you’ve seen the video of the jewel wasp (Ampulex compressa) turning a roach into a zombie, but it’s pretty creepy. Or maybe it’s the History Channel voiceover? That a fungus – a completely different kingdom – can affect ants is, in some ways, even more disturbing. Interesting and well written blog entry. I might become a fan. Isn’t there a kind of parasitic worm that does a similar thing to ants? I seem to recall one that takes over ant brains and forces them to basically get eaten by cows in order to infect the cow’s digestive tract. Yup! It’s Dicrocoelium dendtriticum (a trematode). Are ants just really good for hijacking? Covered are hookworms, zombie cockroaches, and that ant parasite that uses the ant to get inside another creature too! That’s a lot of leaves! Hi, nice article. Do you have a citable publication about the parasitic behavior of cordyceps? Hi, Wil! Here is the link.